This semester, I am teaching Expansion of the United States and had my students read The Searchers: The Making of an American Legend by Glenn Frankel, an excellent study of how a historical event can get turned into a movie. The book is chronological, and the reader can see how the story continues to evolve as different people use it for different reasons. I will not go into great detail, but, as the story gets passed on, those who tell it do so with various reasons. In the end, the story barely resembles the reality, and the reality, to many, would be more interesting. I chose this book because I want my students to know that there is more to history than what happened in the past. History is also about who interprets it and when they do that. I believe it is as much about the people looking into the past as it is about people who lived in the past. 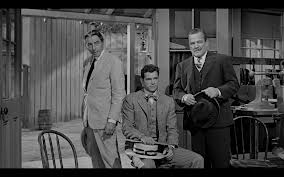 One of my favorite movie lines comes from The Man Who Shot Liberty Valance. When Senator Ransom Stoddard finished telling reporters about his life and what happened in the town of Shinbone, Maxwell Scott, the newspaper editor, rips up the notes and throws them into the fire. That line conveys the difficulty that historians of the American West, or any other history, faces when trying to find out what happened way back then. Dime novels. Newspapers. Journals. Diaries. Inaccuracies and embellishments can be found everywhere. However, it is not just those who record history who cause problems. Those who took part in history do the same. In the book I mentioned, the story was being told incorrectly from almost the beginning, and those incorrect accounts were coming from people who were there. This brings me to a video I stumbled upon while scanning through YouTube. It is called The American West of John Ford and should be watched by anyone who likes the Western genre. John Wayne, James Stewart and Henry Fonda reminisce about working with Ford and take turns interviewing him. During those interviews, all of them freely admit that Ford was not interested in depicting historical accuracy. He was interested in telling stories within a Western backdrop. He used the genre to study the human condition. However, there was one part of the documentary that got my attention. While talking about My Darling Clementine, about the actions at the OK Corral, Ford said that Wyatt Earp had personally told him what happened at the gunfight and drew a map for him. In the movie, Ford depicted the gunfight just as Earp had described. According to Earp, a stagecoach came by, and he used it for cover to get closer to those he was after. I have read a ton about Wyatt Earp and the OK Corral. I have been to Tombstone, Arizona and stood where the gunfight took place. At no point have I ever heard about a stagecoach being used as cover. It could have happened, but that would be a new take on it for me. Hopefully, a historian can tell me that I am wrong, but I do not think a stagecoach had anything to do with it. So, who are the makers of legend? Was it John Ford, a director who admitted to not caring about historical accuracy? Was it Wyatt Earp who could have embellished a story to impress his Hollywood friends? Was it the director of the documentary who included that story in his movie? Is it me for writing about it?